After a break of a little over a week, it’s time to get down to the last leg of blogging for this month! Gosh. It’s going to be September already! And then, just three more months till the new year is upon is. As unbearably cliched as it all sounds…time does fly. These are the two books I have been devouring this past month. Larousse Gastronomique is a culinary reference book that any curious home cook would find useful. I saw it in the sale bin at Crossword (Just INR 250!!) and I could not pass it up. Seriously. Sales at bookstores are bad for me. I always buy more than I can carry, and then I have to find innovative ways of making space on my bookshelf. But my father always told me that books are an investment, so I tell myself that all these books are for my “intellectual nourishment.” Plus, I think it would be nice to hand down a living, ink-and-paper library to my son- who knows what will happen with the next digital revolution! ANYWAY. Larousse. Many of the recipes are classical French, interspersed with other regional recipes (Californian avocado salad and Turkish imam bayildi.) The book also covers plenty of basics, like how to prepare a bouquet garni, how to make aioli without eggs, as well as recipes for sauces and dressings. There is also a wealth of information on how best to prepare vegetables (for example, when preparing beetroots, you should leave a bit of the root on, as cutting it off completely will force the root to bleed and lose colour before boiling.) If you are looking for more ways to cook up simple veggies, this book is for you. And many of the recipes are quite fuss-free, and can be made as a side on a busy weeknight. And the second book, Paris My Sweet. After reading David Lebovitz’s The Sweet Life In Paris, I was happy to come across another book chronicling the life of a sweet-loving American expat in the city of lights: Paris, My Sweet. While DL’s book contains recipes and is written in the voice of equal parts chef and expat, Amy Thomas writes solely from the heart of a “sweet freak.” It’s a wonderful collection of anecdotes about desserts in Paris and New York, with each chapter dedicated to one specific kind of a dessert (a chapter each on cupcakes and macarons- I was hooked!) Thomas has maps of the best dessert spots at the end of each chapter, and a longer list at the end of the book. As described in the book, she is a copywriter for Ogilvy, on assignment in Paris, writing copy for Louis Vuitton. So she does seem to have the perfect life, and, while we all know that living alone in a foreign country can have it’s downsides, there are parts of the book which get a tad annoying…a little Carrie Bradshaw-esque. (Oh, Paris, how wonderful you are; but how difficult it is to fit in! Why aren’t Parisiennes more friendly? Oh New York, how I miss you!!!! Thank God, I’m back in NYC on holiday! Hooray home! But everything seems so alien in America…how noisy…how can people not be chic 24×7? How I long for thee, Paris! OMG my best friend is getting married! Gulp…) You get the picture, right? But Amy Thomas’ devotion to sweets and the pure pleasure she derives from searching for them and savouring them makes up for it. You will need a stash of something sweet while reading this, because every bite and morsel is described beautifully and delectably. And on that sweet note, allow me to introduce what I’ll be baking/cooking with this week- chocolate and orange! Apart from chocolate & mint and chocolate & peanut butter, (Reese’s Peanut Butter Cups are awesome and don’t you let anyone make you feel like a lesser mortal for loving them,) chocolate and orange was the first different flavour combo I tried. Nutty chocolates, coconut filled Bounty bars, Hershey’s cookies ‘n’ creme and vanilla and strawberry cream-filled Russel Stover assorted chocolates- (remember those?) were all my kiddie palate had been exposed to. Love the chocolate and orange combo but only if it’s dark chocolate! Lovely post as ever Meenakshi, you do write so damn well! Mmmm- chocolate and orange! That’s my fav combination. For a while, ‘After Eights’ came in a dark chocolate -orange flavour. I was in heaven when I found it. But I’ve not seen it in years! Your blog always makes me hungry, Meenaxi. Why..why..why. And I just ate lunch an hour ago 😦 Lol. Loved reading this one. The bit on Carrie Bradshaw (who gets on my nerves) had me cracking up. People in the office are sending this-one’s-crazy looks in my direction. Likhte raho, likhte raho. Chocolate and orange is a mating done in heaven . Particularly dark chocolate and mandarin orange. 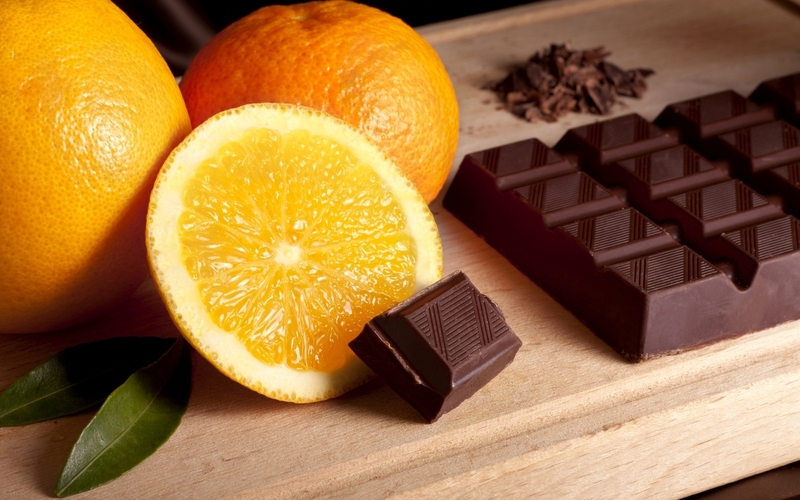 The bitterness of the dark chocolate is perfectly nuanced by the amazing freshness of the tarty,sweet orange. I remember a lazy afternoon at the Fisherman’s Wharf in San Francisco when I allowed myself to get lost in the smells and flavours of the Girardelli shop. It was pure bliss ! Enjoyed your post, Meenakshi, as always ! Mm yum! Have you ever had the chocolates shaped, carved, and flavored like oranges? It’s like a mocha orange creamsicle in your mouth.